I wrote in a previous post about the icons of the last Tsar and his family to be seen now in many Russian cathedrals, churches and church kiosks. During my latest trip I looked out for them again, and they were everywhere. We travelled to the source of the River Volga, a spring rising in the Valdai Hills, Tver region. It was a long bumpy drive from Ostashkov, where we were staying. 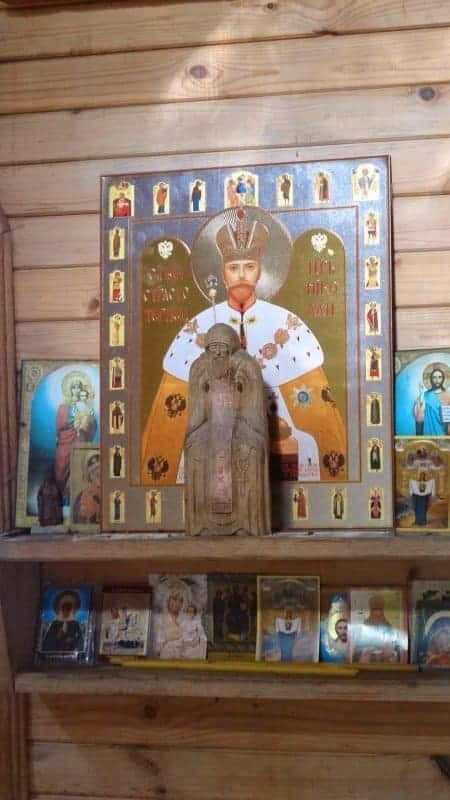 Within the small wooden building over the spring visitors had left a variety of icon cards, dominated by a large icon of Nicholas II. 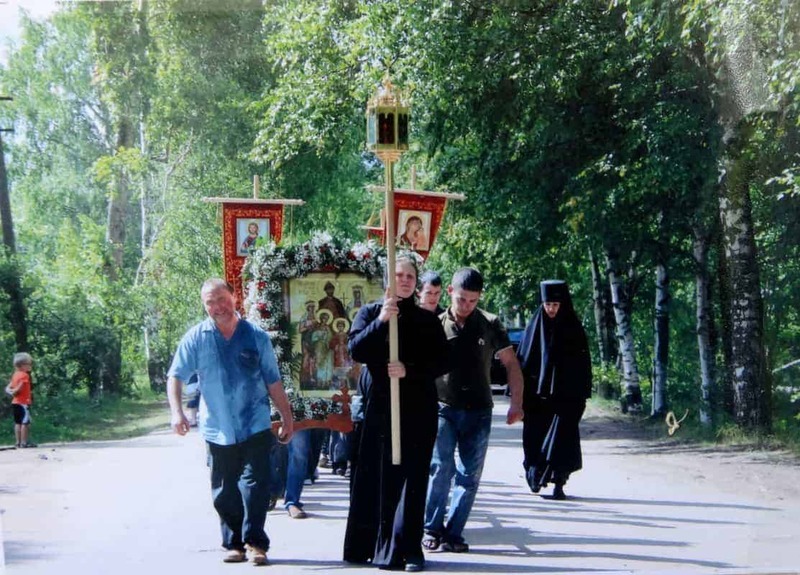 We saw evidence in a religious community in Ostashkov of their fondness for these images. This photograph of a local procession was on show there. And in the city of Tver, its most ancient monument, the stone White Trinity Church, had a fine icon of the imperial family. Paul Gilbert, a Canadian Russophile, has created a lavish website, ‘Royal Russia‘, a cornucopia of information and images to delight anyone fascinated by the Russian royal family and imperial Russia. He includes the 1996 ‘Report on the Canonization of Saints with Respect to the Martyrdom of the Imperial Family‘ produced by the Russian Orthodox Church. It’s illuminating for those like myself who find the religious veneration of the family slightly mystifying. The 11th-century Russian princes Boris and Gleb are mentioned in this report. ‘The murder of the Royal Family on the night of 17 July, 1918 repeats the central event of the primary spiritual history of Russia – the murder of the passion-bearers, princes Boris and Gleb, in the year 1015. Their death established the heroic deed of non-resistance to violence – and this same feat was providentially repeated 900 years later by the last of the Romanovs.’ I’ll write about Boris and Gleb in a future post.